Do you find HappyHours.com useful? Chance to WIN $100!!! Take the HappyHours.com Survey Now. In this issue of the Island Travel & Tasting Tour, we feature the secluded island of Anguilla. As with each island tour, we review the spirit brand for which the island is known as well as one of the most luxurious places to stay. In addition, we feature some of the local restaurants in order to give our readers a taste of what they can expect to experience. Ready to join the travel and tasting tour? There are many people who have never been to Anguilla. But of those who have, few people have been to Anguilla only once. The island is simply magical and you instantly form a special bond with it. Anguilla, BWI is an English independent territory in the northeast corner of the Caribbean. Its greatest asset is its 11,000 industrious, conscientious, fun-loving, and welcoming people. With tourism as their largest industry, Anguillians are committed to showing you their beautiful island with pride and hospitality. 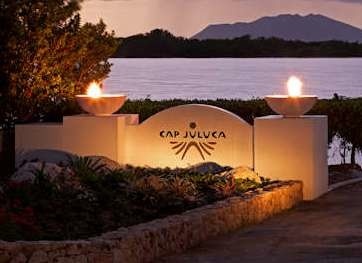 What Anguilla lacks in size, it more than makes up for in its much sought after Caribbean asset – pristine, powdery beaches. The island is long and thin, creating an endless shoreline of over 30 of the world's most beautiful beaches. Many are over 1½ miles long – and not one has a high-rise. Some are entirely unoccupied while others have beach bars or spectacular private villas. The waters off of these beaches are equally spectacular. Boasting 12 miles of white coral coastline, Anguilla is a snorkeler's and scuba diver’s paradise. The weather is warm but always breezy. The winds come from the east and keep you cool during the day. After 200 years, whiskies from the state of Kentucky are on the charts with a bullet. In fact, bourbon has become something of a phenomenon in nightclub and bars. Being tagged as a “good bourbon bar” is like getting a triple-A rating from Standard and Poor. You’re likely looking at a bright financial future. A happy hour for Caribbean rum distilleries Sales of upscale boutique rums grew 32 percent last year, giving producers large and small a chance to cash in. Click here for more. SKOAL! COMRADE:VODKA DARES TO CHALLENGE GREY GOOSE Your next vodka martini could cost you a little less. The red-hot vodka category is about to get a bit more competitive as a value brand popular outside the U.S. is about to launch a stateside marketing blitz - taking aim directly at Grey Goose, the category's No. 1 super premium name. Click here for more. Absolut offers New Orleans Vodka and recipes to sip it in Launched at the Tales of the Cocktail event this summer, Absolut New Orleans ($26, 750 milliliters) is a mango-and-black-pepper-infused vodka that's just right for a steamy September evening. Click here for more. Restored barn to host East End vodka distillery The Long Island potato has squeezed into a vodka bottle once again. A restored Baiting Hollow barn is being converted into the East End's first modern vodka distillery, a niche business that owners Richard Stabile and Dan Pollicino envision growing to include in-house production tours and a tasting room, featuring several flavors, overlooking an 80-acre potato field. Click here for more. Anguilla Island Travel & Tasting Tour -- A Review of Island Cuisine, Cocktails and Luxury Resorts HappyHours, Inc. Click here for more. The First Vodka Ever to Be Sold Exclusively Online Mustang Vodka, LLC Click here for more. Admiral Imports Positioned to be Leading U.S. Importer of Absinth Admiral Imports Click here for more. American Vodka Producer Blue Ice Extends Premium Boutique Portfolio With the Launch of New Organic Wheat Vodka 21st Century Spirits Click here for more. In an ABSOLUT World, True Taste Comes Naturally and with a Touch of the Tropics Pernod Ricard USA Click here for more. Quay Vodka, an Imported Luxury Mediterranean Spirit, Docks in America Bravado Imports Click here for more. Consumers Can Now Recycle Wine Corks Willamette Valley Vineyards Click here for more. Canadian Acting Legend Dan Aykroyd to Visit Winnipeg on Promotional Tour Diamond Estates Wines & Spirits Ltd. Click here for more. © 2002 Happy Hours. All rights reserved.